Thank you for your interest in the SDSU Speech and Debate program, also known as “Aztec Forensics.” Located in the School of Communication, Aztec Forensics competes in a variety of formats, including Lincoln-Douglas Debate, Individual Events, and Parliamentary Debate, making SDSU one of the premiere comprehensive forensics programs in the country. SDSU Speech and Debate competes on both the local and national circuit, and is a proud member of a number of organizations, including the Pacific Southwest Collegiate Forensics Association, the Western States Communication Association, the National Parliamentary Debate Association, and the National Forensics Association. If you’d like to know more about where we travel, visit the Aztec Forensics Competitive Schedule. 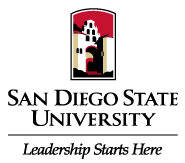 As Director of Forensics at SDSU, my goal is to make you a valuable member of our program, so please feel free to email me anytime at anuckelscuevas@sdsu.edu for more information. Do I need any experience in Speech and Debate to join the program? No experience is necessary to join the SDSU Speech and Debate program. There are novice divisions for new members, as well as Varsity divisions for experienced competitors. How much time does Speech and Debate take during the semester? Students competing on the SDSU Speech & Debate program typically practice once a week with the team and compete between three to five weekend tournaments per semester. Can I receive credits for competing? Students can enroll in the COM 301 Interscholastic Speech and Debate course offered in the School of Communication. The class is 1 credit but can be taken for 3 credits with instructor permission. Are there requirements to joining? Students must be in good standing with SDSU, be enrolled in at least 12 credit hours, and must be carrying at least a 2.5 GPA to compete with the program. Can I watch a tournament before competing? Sure. There are four tournaments that occur over the course of the year in San Diego County. What events does SDSU compete? SDSU Speech and Debate is a comprehensive program that competes in Parliamentary Debate, Individual Events, and Lincoln-Douglas Debate. At the end of the year, the team competes in the national tournaments of the National Parliamentary Debate Association and the National Forensics Association. Visit the Aztec Forensics Competitive Schedule. This year, the team will compete at Colorado College in Colorado Springs, Lewis & Clark College in Portland, Oregon, the University of Nevada in Las Vegas, and the University of Utah in Salt Lake City, Utah, just to name a few. This all sounds awesome. How can I join? Contact Ashley Nickels-Cuevas, SDSU’s Director of Forensics, by email at anuckels-cuevas@sdsu.edu.